The death toll of the Dec. 26 Indian Ocean tsunami is nearing 150,000, and aid is finally starting to reach millions of traumatized victims along the shores of hard-hit Indonesia, Thailand, Sri Lanka and India. Tsunamis -- giant waves triggered by earthquakes and volcanoes -- can't be prevented and they can't be predicted. The only protection for a growing coastal population is a warning to evacuate. A series of Pacific Ocean tsunamis over the last century fueled the establishment of an ocean-wide warning network. But the Indian Ocean, where tsunamis are less common, has no such system. So when earthquake specialists in the United States and elsewhere saw the first signal of the giant Dec. 26 quake, they had no way of knowing whether a tsunami was under way. And even if they had known about the tsunami, they had no way to alert coastal communities that titanic waves were racing at them -- as fast as a jet plane. So as the scope of the current disaster began to emerge from drowned beaches and bloated bodies, officials in several nations started discussing a warning network for the Indian Ocean. 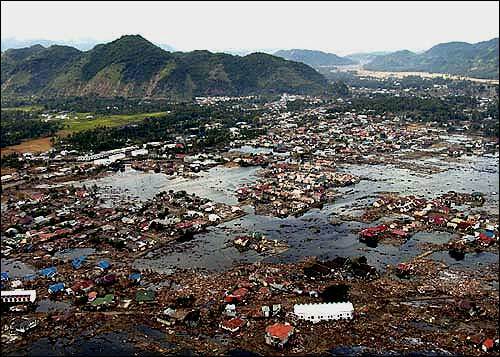 Japan, source of the word "tsunami, offered to expand the existing Pacific warning network southward, where the Philippines is a tsunami nexus. Australia's Foreign Minister, Alexander Downer, said his country was willing to set up a system for the Indian Ocean. And Indian Science and Technology Minister Kapil Sibal promised to emplace up to a dozen undersea monitoring stations in the Indian Ocean within 30 months. Sensors to detect earthquakes and ocean waves, and computers and scientists to analyze the data and issue warnings. Communications equipment to transmit a warning. Local emergency response teams to translate the warning into quick evacuation. 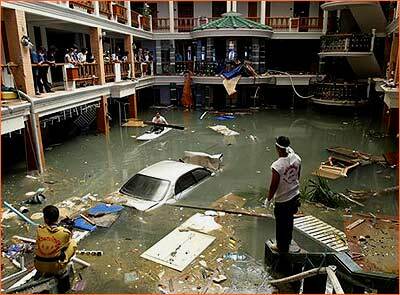 Tsunamis cross the ocean at roughly 500 miles per hour. And because they are caused by underwater earthquakes, which are completely unpredictable, the warning process must be fast -- and accurate. Coastal evacuations cause massive dislocation, and false warnings can be dangerous if they cause people to ignore the next warning. The Why Files asked Paul Whitmore, scientist in charge at the West Coast and Alaska Tsunami Warning Center, about the warning process. He said detecting tsunamis and issuing the warning was the easy part: It's much harder to alert people in vulnerable shorelines in the minutes or hours before a tsunami strikes. Indeed, the Alaska-West Coast center urges coastal residents to seek higher ground whenever they feel a strong quake, without waiting for a warning. 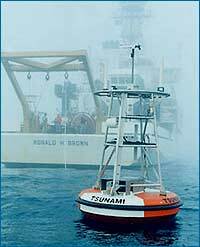 The confirmation of a tsunami must come from an instrument that measures real waves. In the Pacific, about 125 coastal tide gauges measure wave height and radio data to the tsunami warning network. Confirmation is critical, Whitmore says, because it can be used to cancel a warning. In the tsunami warning business, crying wolf is dangerous. "Every now and then, we get a sequence of big earthquakes in Alaska and have to call a warning, and we'll get a minor tsunami or none at all." Whitmore says it could take "a couple of years" to build an Indian Ocean system "if they try to start from scratch." He suggests that existing tide gauges in the Indian Ocean may be used for a warning network if they are equipped to send data by radio. Whitmore also advises taking advantage of the existing warning infrastructure in the Pacific. While some new ocean sensors would be needed in the Indian Ocean, seismic information is already available, and existing computers and programs could crunch the new data. The data crunching, at least at first, could be done at centers in Japan, Alaska or Hawaii, he suggests. "There is something nice about having the tsunami warning center right in the vicinity, and that should be the long-term goal, but by utilizing existing systems, they could do it faster."